Sen. Akaka helped name both of her daughters. WASHINGTON — Sen. Tammy Duckworth (D-Ill.) has become the first U.S. senator to give birth while in office. “Bryan, Abigail and I couldn’t be happier to welcome little Maile Pearl as the newest addition to our family and we’re deeply honored that our good friend Senator Akaka was able to bless her name for us — his help in naming both of our daughters means he will always be with us. Duckworth, a retired Army lieutenant colonel and helicopter pilot who lost both legs in the Iraq War, had her first child in 2014 while serving in the House of Representatives, becoming one of only 10 women who have given birth as sitting members of Congress. Her daughter Abigail’s middle name is O’kalani. Her husband, Bryan Bowlsbey, is also an Iraq War veteran. Duckworth is taking time off to bond with her new daughter, but will remain in Washington, D.C. in case her vote is needed. 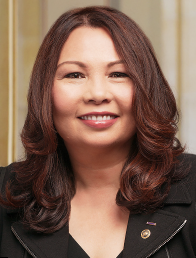 Duckworth, the first Asian American woman elected to Congress from Illinois and the first member of Congress born in Thailand, previously served as an assistant secretary in the U.S. Department of Veterans Affairs and director of the Illinois Department of Veterans Affairs.